Specially licensed by the Ming Emperor, this premium quality sea salt comes from the oldest sea salt works in China. Traditional processing assures the naturally occurring minerals and trace minerals remain intact. 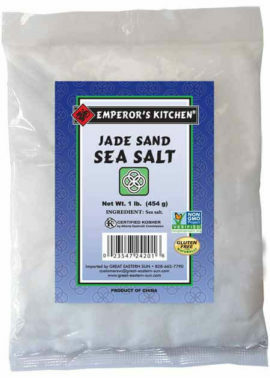 Enhance the flavor and nutrition of all your dishes with Emperor’s Kitchen Pacific Jade Sand Sun-Dried Sea Salt.